After a long night of rain, Sunday turned out to be gorgeous. Again, I shared a table with RH of Poets Wear Prada Press. I decided to sell CW's and JI's Math Paper Press books, as well as my own. GH helped me design a sign, Singapore Poetry, which I taped to the top of the stand, and in front of the table. Singapore Poetry was certainly a draw. People who have lived in Singapore, have visited Singapore, or have a cousin who have been to Singapore came over to talk. Singaporeans came bounding to the table, surprised and pleased to find Singapore Poetry at the Brooklyn Book Festival. A nunber of Asians checked out the books too. And a Brooklyn bookseller who really liked the design of the Math Paper Press books. Watched this 1950 film last Tuesday, and was wowed by it. I prefer Seven Samurai, but can totally understand why someone may think that Rashomon is the greater film. Essentially a crime drama, it provokes big philosophical questions about the nature of truth. A samurai (Masayuki Mori) is killed and his wife is raped, but those are the only agreed-upon facts in the four tellings of the story. In three of the four versions--by the woman (Machiko Kyô), the bandit (Toshirô Mifune) who raped her, and the dead man speaking through a medium--the teller confesses to the killing. Each version also sheds light on the character of the teller, and why he or she wishes to incriminate himself or herself. Let me in your adda, shoot the breeze and hang up my Adidas. You turn up the Bose speaker as you draw the loft to be built by Carnegie Hall. Who gives the smacks to make these bad gay movies with such corny scripts that we keep getting from Netflix? It’s easy to misread my handwriting in the Hallmark card, to read to have for its partner to hold. Watched Seven Samurai over two nights, and loved it. One of the imdb reviewers put it best, there are certain directors who just "get" it, who get the medium, and Akira Kurosawa is one of them. I was tired, I was doing what I thought of as a "duty," but I was mesmerized throughout the movie (3 hours, 27 minutes). Total involvement, that must be a criterion of great art, surely. Takashi Shimura, who plays the leader of the band, provides the moral center against which Toshiro Mifune's antic samurai tilts. Isao Kimura is the young untested warrior who falls in love with a farmer's daughter. Before my MoMA card expires, I will top up my plastic bottle with Perrier. Don’t slip and sit hard on the floor by stepping on the lemon-scented overspray of Furniture Polish. I lift the Bench Press book off the top shelf and read you the poem about love’s carelessness. In your 2(x)ist underwear I bought for your birthday you sighed in our cot, I woke up in Paris. Why don’t we have any A-list friends, you spit and stick your purple toothbrush aslant my Oral-B, blue and down the middle transparent. It doesn’t treat but takes away the itch, this cream from Singapore, Mopiko for mosquito bites, made of menthol and camphor. My big summer reading book was The Tale of Genji, which I read and blogged about in an earlier post. My feelings toward the book are colored by the start of summer and by summer's long afternoons in Central Park. I borrowed from the school library E. L. Doctorow's Ragtime, which I liked enough to be happy to find another novel by him in the apartment in Nice. TheWaterworks, my second Doctorow, has a rather predictable plot and characters that seem more symbol than flesh-and-blood. It is a pleasant enough way, however, to learn more about New York City in 1871. For instance, where the New York Library now stands, there used to be a reservoir. 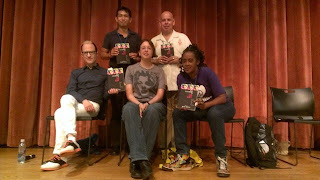 I was at the Decatur Book Festival this weekend to launch the anthology This Assignment Is So Gay: LGBTIQ Teachers on the Art of Teaching. The launch at Decatur High School, introduced by Georgia State Representative Karla Drenner, and moderated by the school's English Head of Department Cara Cassell, was well-attended. I read with Pablo Miguel Martinez, Theresa Davis and anthology editor Megan Volpert. Ed Madden could not make it to due to a neck problem, but Wayne Koestenbaum kindly stood in, and read two of Ed's poems. The Q&A session after the reading was filled with questions from the audience. How would you motivate homeless LGBTIQ youth to study? What has given you hope recently in your teaching? I was pleased that someone bought a copy of my Seven Studies after just hearing me read one of my poems.